 This fourth life of writer James Baldwin won't give a bad name to authorized biographies, but neither will it elevate the suspect genre to new heights. Leeming (English/Univ. of Connecticut) met Baldwin in 1961. 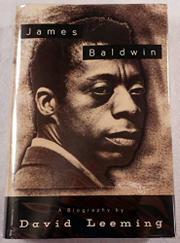 By then, Baldwin was perhaps the best-known and most widely read living black writer in the United States. Their meeting place was Istanbul, where Leeming was teaching and Baldwin was visiting a friend. Although Leeming's presence in this biography is minimal- -even in the Turkish chapters--his professional and social relationship with Baldwin grew rapidly. He was designated authorized biographer and granted access to Baldwin's private papers in 1977, ten years before Baldwin's death at 63. Throughout the text, Leeming seems to struggle with his official status; he slips into the various roles of friend, sycophant, defender, and personal secretary. The alternate references to ``Jimmy'' and the more formal ``Baldwin'' give the book a split personality. Despite this schizophrenic tone, this biography has value as a life chronicle. After all, Leeming saw and heard a great deal that previous Baldwin biographers had no opportunity to see or hear. Leeming deals extensively with Baldwin's precarious (and shifting) place on the racial divide, with his homosexuality, and with the mental instability that led to suicide attempts. Leeming does a workmanlike job of portraying Baldwin's Harlem childhood, the writing of the early books, Go Tell It on the Mountain and Giovanni's Room (among others), the search across the world for a country to call home, and much more. The book is rich in detail but not overly long. Baldwin's life was so inherently fascinating that only a hack could make it dull. Leeming is no hack. But, despite Baldwin's labeling of Leeming as ``my Boswell,'' the biographer is clearly not that, either.